The Champion Sports Collapsible Water Bottle Carrier Set has everything you need to conveniently keep your team healthy and hydrated. 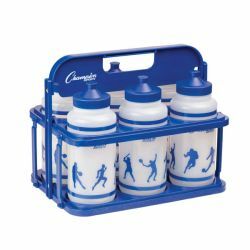 Each set includes 6 plastic quart size bottles and a collapsible plastic carrier. The quart size bottles feature a comfort grip with a push/pull lid, have a high-volume flow which allows you to drink without your mouth touching the bottle—perfect for sharing—and the wide mouth bottles are perfect for adding ice. The carrier is made of durable plastic and folds flat for easy storage.